Do You Know What It Means to Miss Times-Picayune? Times-Picayune in the better days. I took this photo on a friend's porch on the morning of the Saints winning the Super Bowl in 2009. 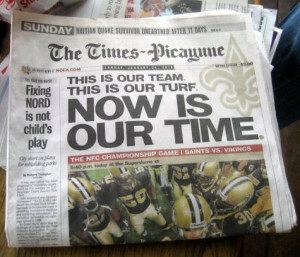 Last Thursday, we’ve learned that the New Orleans daily, The Times-Picayune (TP), will start publishing three times a week (Wednesday, Friday, Sunday) under a new company called NOLA Media Group, with reduced staff (rumor has, one-third will be laid off) devoting their time to the paper’s online presence. Jim Amoss, the editor, will run the combined content operation. A story by Kevin Allman in Gambit‘s Blog of New Orleans explains that those who stay at the TP will be “reporting news very differently,” likely filing smaller stories more frequently for the paper’s online affiliate, NOLA.com. Copy editors, graphic artists and page designers at the T-P building [at 3800 Howard Avenue] will then take the material and use it to construct three editions of the paper each week… There will be no content that is produced specifically for print, though the company may produce some special sections. The changes announced Thursday were combined with similar moves at three major Alabama daily newspapers also owned by the Newhouse family group’s Advance Publications. The Birmingham News, the Press-Register in Mobile and The Huntsville Times will switch to publishing three days a week as part of a new focus on online news. [T]he Times-Picayune remains one of the nation’s most successful newspapers. Of the top 50 large-sized markets, the newspaper has the highest rate of readership of its daily edition in the U.S., according to Austin, Texas-based Scarborough Research, a firm that tracks the industry. Besides the obvious — print publications’ revenue is down, and newspapers all over the country are hurting — the TP news has spread like wildfire on the national level, spurring heated editorial, hundreds of comments, and extensive coverage in large outlets like The New York Times and The Washington Post. Through wars and floods, the ‘Aints and a Saints Super Bowl victory, the TP has been and remains an integral part of our daily routine and our culture. Louisiana as a whole has a problem with corruption, the school system has been Balkanized and the prisons, which are run for profit, are jammed. It is one of the worst-run cities in America, but it is also among its most vibrant, and absent an aggressive watchdog in the form of a daily paper, I don’t see things getting better. And this slow suicide […] will continue unabated until the industry swallows hard and takes its product — every last newspaper — behind a paywall. Experiments in Ann Arbor, Mich., and with the Booth newspapers in Michigan demonstrated that smaller staffs and a reduced print schedule could be sustainable, so Katrina and sentiment be damned, The Times-Picayune will become the largest guinea pig so far in an experiment that will end in either death or transformation. To tell you the truth, I’ve relied on Nola.com (and its imperfect iPhone app) as my source of news and event listings for a few years, so I don’t feel qualified to wax poetic extensively about the TP’s downgrade as I’ve probably contributed to those diminishing readership numbers. However, I do know what it means to miss New Orleans, and the paper is an extension of the city’s unique culture and history. Also true: If you want breaking news, chances are you won’t rely on the next day’s edition of the TP. Some also criticize the paper for its provincialism and devoting too much front-page space to the Saints coverage, among others things. But many will miss the paper precisely for those reasons. In New Orleans, you mention that you “read it in the paper,” and no further clarification is needed. How many metro cities have “the paper”? Quite a few friends have also mentioned how much they’re going to miss getting the paper off their porch every morning and reading it with their first cup of coffee. The local attachment to TP is incredible. While we love it for sentimental reasons (TP has been there for the residents of New Orleans through Katrina with its heroic coverage — no one can ever forget that), let’s not forget that the paper is a good one. There’s its capability to deliver Pulitzer-winning content, including those famed, in-depth investigative series that has unearthed the corruption in the city that’s overrun with it. There’s also an eclectic mix of talent and characters (Chris Rose is one columnist whose TP stint, including his post-Katrina body of work, has given him national exposure), and this one-of-a-kind feel you get, say, around Mardi Gras, when you open the paper to find pages and pages of the Mardi Gras royalty pics, listings of balls, and maps of parade routes. My worry is not about the loss of the earthy smell of freshly rendered pages. […] The constancy of a daily paper […] is a reminder to a city that someone is out there watching. Important journalism will still be done at The Times-Picayune. Jim Amoss […] and the talented staff will make sure of that. But you have to wonder whether it will still have the same impact when it doesn’t land day after day on doorsteps all over the city.